Deep linking refers to the inclusion of hyperlinks within content directing traffic beyond a business’ home page and other entry pages. The practice is used in web marketing to guide visitors to pages that contain more informative content, including calls to action, which can help businesses improve web conversions. Deep linking is good practice for online conversion marketing strategies, and it’s a key way to keep visitors on a website to provide multiple transaction opportunities. In SEO campaigns, deep linking typically includes placing a link on a keyword or phrase that brings people to respective conversion pages or related articles on a site. Deep linking increases site navigability. This is important in engaging audiences and making it easier for them to find information that will encourage conversions, but it’s also key to making it easy for search crawlers to find and index every page of a website. The more pages search engines index, the more opportunities websites have to become discovered via search. Additionally, links to deep site pages may help increase rankings for these pages. While marketers and webmasters debate the extent to which internal linking really impacts the “votes” for a given page in search rankings, site deep links still count to some degree as inbound links pointing to a web page. Matt Cutts has explicitly told marketers to make sure crawlers can follow internal links across a site. As linked keywords and other deep links are embedded in entry page content, traffic to these valuable conversion pages will (ideally) increase. 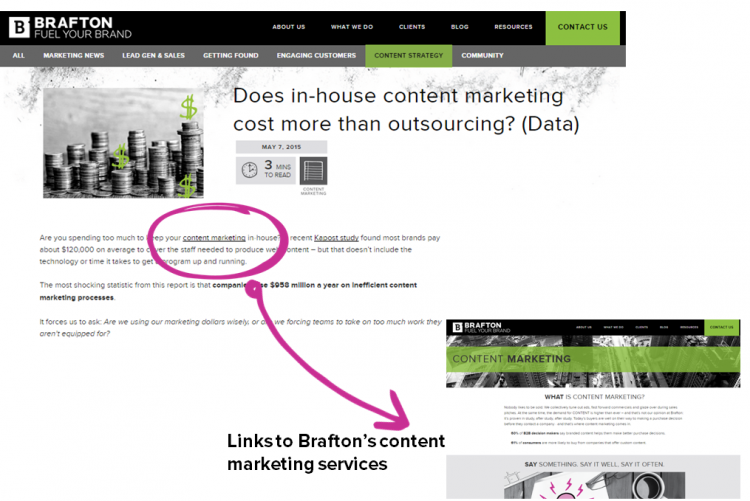 See conversion marketing for more on how linking strategies and calls to action can bring visitors to deep site pages.